Red cabbage, often called purple cabbage because it tends to look more purple than red, turns into a visually depressing mess if not cooked in the right conditions. This is due to chemical reactions with substances in the water and metal with which it comes in contact. 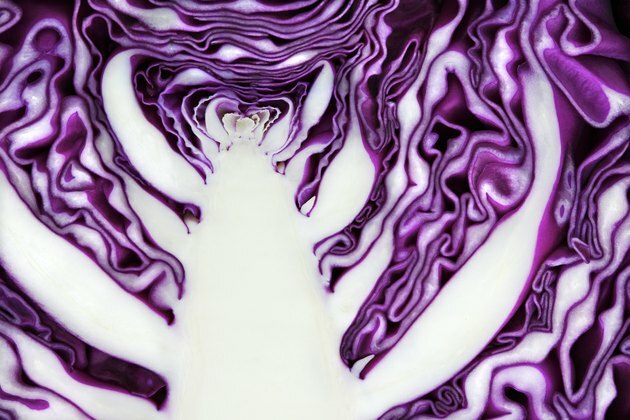 Rather than choosing the other ingredients for their ability to match a blue or gray color scheme in your dinner, prevent the cabbage from changing color in the first place. Cut and cook the red cabbage with nonreactive equipment only. Some of the metals used in cookware can leach into or otherwise affect the foods they come in contact with. This can offer advantages, like increasing the iron content of foods cooked in cast iron, but reactive metals also change the color or taste of certain foods. Carbon steel, aluminum and cast iron change the color of red cabbage. Even if you are boiling the cabbage, it can still touch the bottom and sides of the pan. Use stainless-steel knives and stainless-steel, glass and unscratched enamel pans. Don't use plain aluminum, but anodized aluminum is fine; the anodization process creates a hardened, nonstick surface on the pan that acts as a barrier between the aluminum and the food. Boil the cabbage in soft water if possible. Hugh Fearnley-Whittingstall writes in "The Guardian" that hard water in any amount turns red cabbage dark blue. Add lemon juice, vinegar, wine or another acidic liquid to the dish while the cabbage is cooking. While the alkaline quality of hard water can discolor the cabbage, the acidic quality of vinegars and other liquids helps protect the color. If you are not following a preexisting recipe, add 1 tablespoon of acidic liquid for every cup of cooking liquid. Adding an apple to the dish as it cooks also stops the cabbage from changing color, according to Fort Valley State University. Is it Ok to Cook Tomato Dishes in Metal Pans?